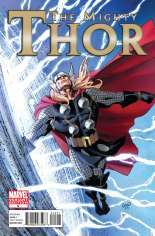 Thor and the Surfer battle on the surface of Mars, hundreds of millions of kilometers away from the ultimate Asgardian - Galactus War! And meanwhile on Earth, Volstagg is left to defend Asgard from hostile invaders with Loki as his only ally. Loki charges into battle bearing the magical gifts of the Weird Sisters that only he can see. Will they be enough? 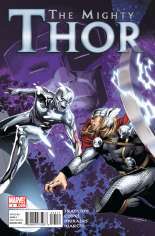 Can they save Thor? And who will survive...the rise of the COSMIC DESTROYER? 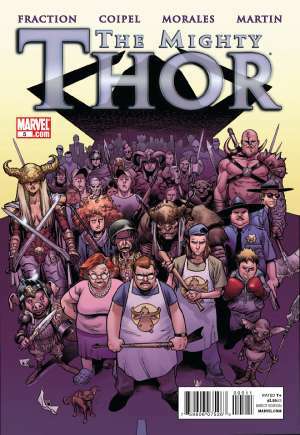 Published October, 2011 (Modern Age) by Marvel Comics and went on sale August 31, 2011 for $3.99 USD. This issue contains 32 pages in Color, the current NM value is $4.00 USD. 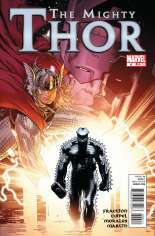 The publisher has rated this issue T+ (9+).